If you’re looking for a cozy take on a coastal escape, you need look no further than Beach Bijou; This ocean view treasure is proof positive that good things come in small packages on Oregon’s North Coast. Of course, there’s nothing pint-sized when it comes to the views. In fact, if this sweet little two-bedroom, one-bathroom home were any closer to Haystack Rock, you’d be wiping the ocean spray off your cheeks. Located at the northern end of Tolovana Park, close to Midtown Cannon Beach, this compact abode was constructed with an eye for maximizing views from dawn till dusk. Whether you’re sitting down in the snug living room, preparing a simple seafood supper in the kitchen, or settling in to sleep after a long day of beach explorations, you’ll be hard pressed to find a single spot in Beach Bijou that doesn’t command a panoramic view of Haystack Rock and its gorgeous surrounding landscape. An earthy color palette, wicker furniture and a warm gas burning stove, all offset with Haystack Rock-inspired art and a shell and starfish motif, complete the effect. The vistas keep on coming out on the long, long deck, where you’re liable to sink into a chair and spend hours studying the tide, tasting the breeze and watching the rock’s many admirers come and go. Beach Bijou is the perfect getaway spot for an intimate gathering with your very favorite folks, be they family or a few close friends. It’s also just steps away from a beach access point, which equals early-morning strolls, late-night bonfires and impromptu seashell hunts made incredibly easy. The cozy kitchen has all your basic amenities covered, and a small TV sits ready to sate those late-night movie hankerings, but we’re guessing that the stunning local scenery will keep you riveted throughout your stay. This home was custom-made made for hunkering down, loosening up and gaining a grander perspective on the world. So snuggle in with your sweetheart and offer a toast to the incredible view. From here, you can see to just about forever. Team members were great and really helpful. They promptly addressed and corrected the charge on the incorrect credit card. They handled the parking mini-crisis in a great way by providing orange cones. (I would advice to procure 2 cones that would stay at the property not to have to retrieve those at the office or to make the "private drive way" sign more obvious). 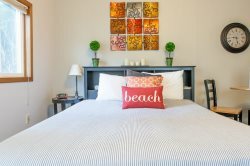 We really enjoy our stay and the location and convenience of the Beach Bijou property. Very kind, friendly, warm people. A joy to work with! Over the years we have stayed at a few other beach front properties in Cannon Beach. Since discovering (like the precious gem that it is!) Beach Bijou we wouldn't consider staying anywhere else. It has a special charm that is unique. I can't adequately describe the enveloping, warm serenity we feel when we walk through the door of 1848 S. Hemlock. Please extend my most sincere thanks to Ms. Westwood for sharing her most lovely beach cottage...and to all the staff involved in managing the magic! On behalf of my husband Steve Flowers and myself, thank you, thank you, thank you!!!! The view of the haystack rock from the living room was incredible. Your staff were very friendly and professional. The house we rented was perfect and you even managed to have pretty nice weather for us :). We'll be back, that's for sure! My guests and I had a fabulous time. I will say the fees for your company seem a bit steep comparatively and helpful if they are included in the nightly price from the get-go. That said, it was pretty worth it for a special occasion. Everything was great. THANKS ! !